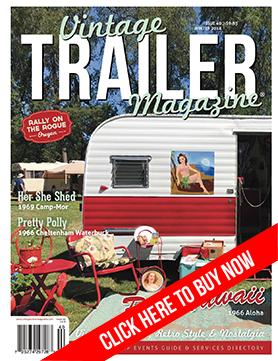 Vintage Trailer Magazine is the world's first magazine solely dedicated to vintage, classic, retro-styled and custom trailers, vintage camper trailers and travel trailers and those who love them. Vintage trailer enthusiasts come from all walks of life and are drawn to vintage trailers and caravans for a variety of reasons. Some have nostalgic memories of childhood seaside holidays spent in trailer parks. Some choose a retro trailer because it looks good behind their treasured classic car on its way to a car show campout. Many have embraced “glamping” in style and enjoy decorating their tiny homes on wheels. Along with a sense of classic style, lovers of retro trailers and vintage camper trailers take great delight in life’s many wonders – they enjoy adventure, travelling to new destinations, appreciating nature’s beauty and living a life less stressful. Vintage trailerites often also share a passion for classic cars or hot rods and will happily devote countless hours looking after their “toys”. They also have a very keen sense of aesthetic style and an eye for making small spaces look absolutely adorable. Created by passionate writer and adventurer Lisa Mora, Vintage Trailer Magazine is an eclectic collection of stories, pictures, ideas and input from sources from all around the world who all share something so much more than a passion for camping.